National Scrapbook Day was also the day of the San Diego Scrapbook Expo. I got a TON of good deals at the Anaheim expo and I used almost all of what I got in the short time between the end of February and the beginning of May. SO, Mike agreed to take me to the San Deigo Expo. I was really excited because some of the booth's that I'd enjoyed and dropped big bucks at in Anaheim were going to be present in San Diego and I could stock up again. Plus I could get some random little things that I don't really like having to order off the internet. But I was a bit disappointed. The stores that were fabulous in Anaheim just didn't "bring it" in San Diego. They had less inventory and the things I was hoping to re-buy or stock up on just weren't there. I did manage to get some good deals. Mike helped me out at the Prima booth, holding and counting my packages so I could get the best deal. I'd forgotten my wallet too, so he was "payment man". He was really good though, quietly following behind me, typing on my phone, as I searched through the booths I was interested in for goodies. 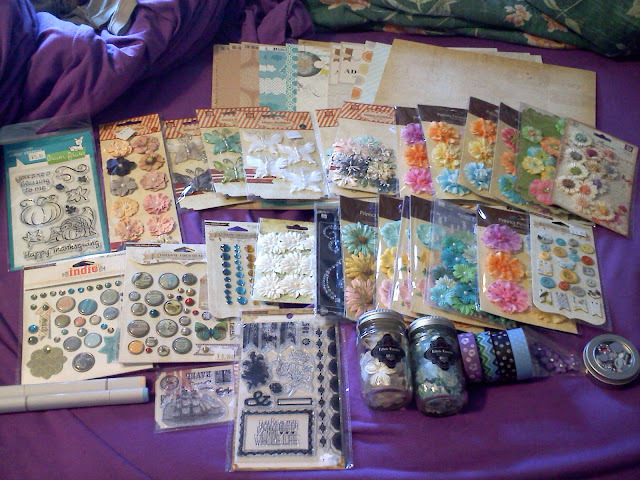 This is everything I got, spread out on our bed as I did before, hehe. I took advantage of the new CHA releases being present to snag some more MME Follow Your Heart papers and embellishments because I'd been using them so much. I also got some of the Queen & Co. washi, cos it's pretty and it's nice to be able to use a ton of something on a project without worrying about using it all up. Mostly what I picked up though was flowers. I've been using a lot of them lately, finding them fun, so I'm just going with it. I find I like these packages better than the whole "bottle of flowers you'll never use up" because, well, the likelihood that you'll use them up is higher. As I said, I used up all the package I bought at the Anaheim Expo, so I needed more. I *did* get two bottles, but they're various colours in the one bottle, and pure white in the other, easy to colour with my Copics to suit my project. I also got this really cool little tin of embellishments. One place had a lot of bins that you could pick and choose what kind of bling and bits you wanted. I filled a $4 tin to the bursting point so that when I use the new flowers that I got (the ones that don't have centres) and the flowers I already have (none of which have centres) I can put a little crystal in the centre and have it look more "finished". Yay. 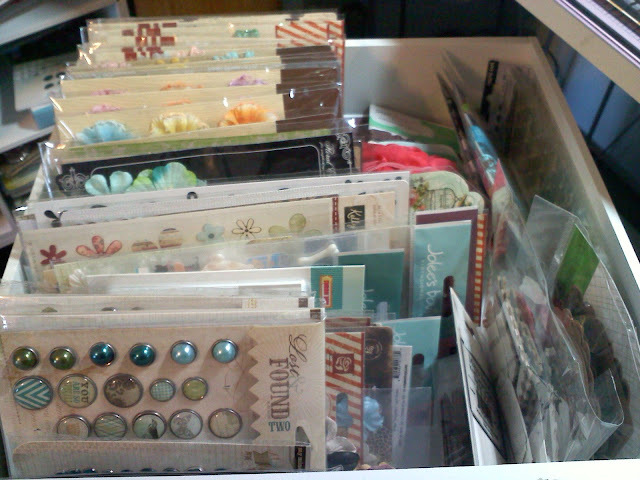 This here is my embellishment drawer. With all the new embellishments I bought I had to shuffle things around in the drawer. Look how full it is! And it's so great because I spent the whole of Sunday using a lot of the MME embellishments and a few of the bottled flowers on the scrapbook pages I posted previous. I like when I bring new stuff in and then get to use it right away. I also got to see this on our trip. And do this. 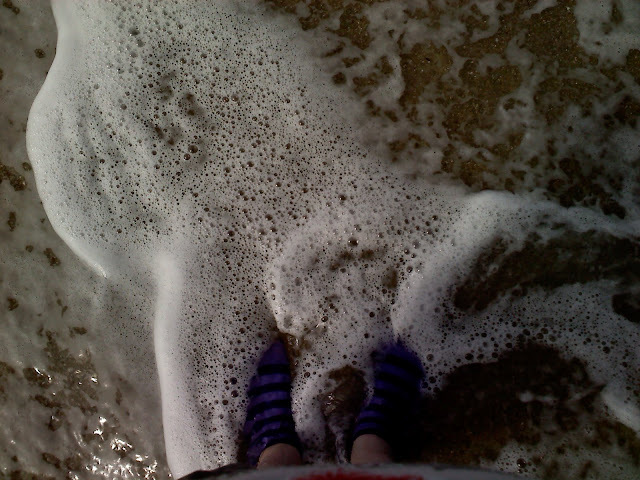 (socks cos I really don't like sand between my toes) I'd been wanting to go to the beach and Mike found a cool tide pool beach for us to visit. 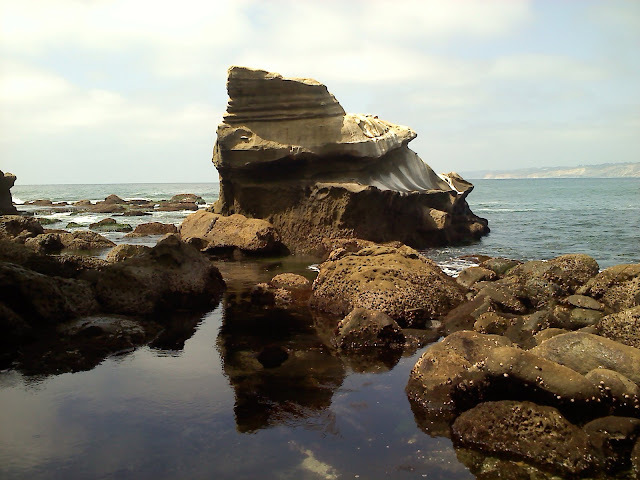 We even got to see sea lions. I wish I'd brought my swim suit, because there were people out swimming with them, and it would have been awesome. Where are you? They have them all across the country, but I know some are hard to get to. They really are a ton of fun! Totally! And I was only at the Expo for an hour! Looks like you got lucky at the expo! I missed both the OC one and the SD one. I need to get in gear and make it to the Ontario one even though its the furthest one from me! I'll be at that one too, Erica! It's actually the closest to me (I'm in Big Bear) and a close friend of mine is making her debut there with her stamp company so please come on by! I've been going to Scrapbook Expos since I started scrapping in '04 and they're literally something I look forward to all year. SCORE!! Looks like you had a good time even though you missed out on what you really wanted - and what an awesome husband is Mike!!! Glad you got to enjoy the 'holiday'!!!!!!! !